From primer to powder, from foundation to blush, from mascara or eye color to lipstick, beauty products play a significant role in women’s lives, being used for the purpose of concealing small imperfections and improving the overall appearance. However, some of the makeup products can cause various adverse effects to the skin like an irritant, contact allergic, phototoxic or photo-contact allergic reactions. Many studies have shown that between 10-25% of cosmetics users have had a skin reaction to a makeup product at some point. If you have sensitive skin, the safest choices are the products with non-irritative ingredients. 1 What are makeup allergies and irritations? What are makeup allergies and irritations? The first one, irritant contact dermatitis, develops when a substance (i.e. strong chemicals) damages the skin (especially the sensitive type), causing a burning sensation, itching, stinging, dry patches, redness, and the appearance of blisters. This reaction generally occurs as the result of a one-time exposure to a strong irritant factor (determining a rapid skin response: minutes to hours) or a repeated exposure to weaker irritants that lead to diverse skin reactions within days or weeks. The latter, allergic contact dermatitis, involves the immune system that manifests a reaction to a particular substance called an allergen after it has been subject to it in either single or multiple instances. In this case, the reaction includes itching, redness, swelling, rashes, burning, and hives, determining a stronger inflammation of the skin. This type of dermatitis takes 24h to several days to develop, and the outbreaks are likely to be more widespread on the skin. To avoid the irritant and allergy-inducing cosmetics, it is advisable to do a patch test. The patch test can be done at home while trying a new product, or in a clinic or laboratory, to diagnose different allergens. If you notice an immediate reaction (burning sensation, redness), make sure to cleanse and wash off quickly, otherwise, wait 24 hours for a response (redness, itching sensation, rash, swelling). If no reaction is noticed in 24 hours, go to the next step. Wait for 24 hours, taking note of any reaction. This will determine if a delayed response may appear or whether the product has the potential to trigger an adverse reaction in a more sensitive area of the skin. If said reactions fail to occur, you should be safe to use the product, or you could continue applying it for a couple of days on the same area to be certain that it si safe to use. Tip: you can use a patch to cover the product on the skin. Thus the amount applied stays in place and does not wash away during the test. If the response is positive and adverse effects appear, such as irritant or allergic reactions, it is advisable to contact a dermatologist for diagnostic testing and treatment immediately. 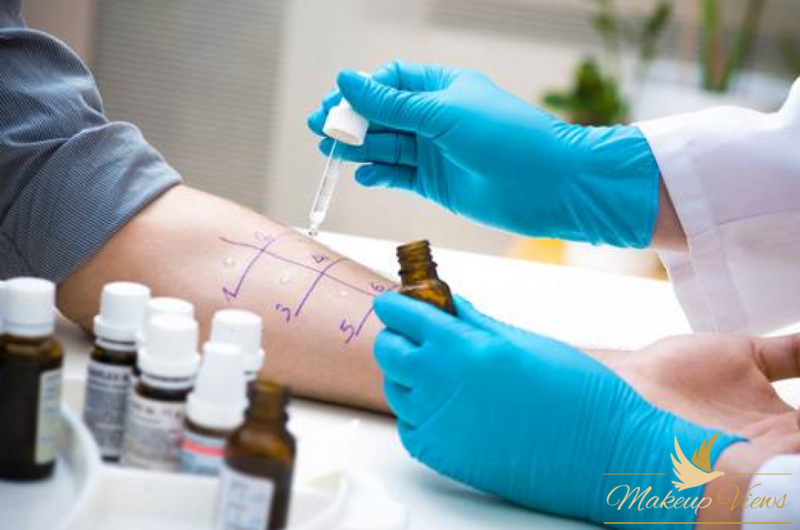 A dermatologist can test each of the ingredients the respective product contains to identify which particular substances you are allergic or sensitive to. This information can be very useful in future as you can check the ingredients in any product before purchasing to make sure they do not contain the allergens that create an imbalance for your skin. If no reaction is noticed, you can safely use the product. The frequency of application and the cumulative effects. In cosmetics, fragrances and preservative agents (classified into three major groups: antioxidants, antimicrobials, and ultraviolet absorbers) are the most frequent adverse reaction inducers. The common substances that can cause adverse effects are parabens, propylene glycol, imidazolidinyl urea, sodium stearyl lactate, di capryloyl maleate, lanolin or formaldehyde or different natural ingredients from plant extracts. When shopping for a product, you should always consult the label, know the list of substances you need to avoid and choose products with the small number of ingredients. You should search for products that are hypoallergenic, oil-free and fragrance-free, dermatologist tested. Be aware that even such products can trigger allergies or irritations unless you test them before use. Also, always keep the makeup fresh and discard any old cosmetics (products that were unsealed more than 3 months back), and have a special regard for the shelf life of each product as this can be one of the most frequent causes of irritation or infection.